Strategy is key when it comes to creating a successful marketing plan. Without strategy, customers and employees can become overwhelmed in a sea of messaging and promotion. This was the case for long-time client American Airlines Credit Union (AACU). Our mission for them was to create a strategic plan focused on maximizing in-branch promotions in order to communicate more effectively with the consumer and help streamline a process for employees. Our research consisted of an internal survey that was sent out to all front-line employees. The results reaffirmed our mission and gave us insight from the people directly affected by the issue. From the data, we learned that their main concern was effectively communicating services and special offers to the customer. This was due to the overwhelming amount of messaging that was being featured within the branch. Additionally, employees didn’t have a defined process to help guide their customer through the different services they offered. They needed a streamlined system that consisted of good marketing materials and talking points. Our main goal was to figure out a way to simplify the messaging. Instead of bombarding the consumer with every single service offered, we developed a strategic plan divided into key periods of promotion for certain services. We developed a variety of in-branch marketing materials to display so that the message was clearly defined and integrated into all aspects of the store. From posters to window clings to teller mats and more, we made sure that all of our marketing elements aligned with each other so that there was no confusion about the message they were trying to share with the consumer. The results that came out of this strategic marketing plan were phenomenal and it proved the importance of effective communication. 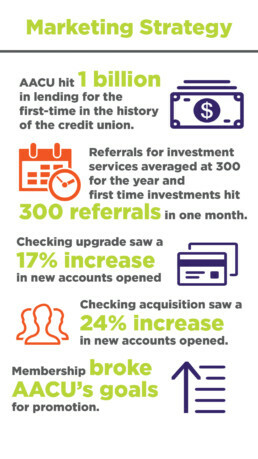 AACU hit 1 billion in lending for the first-time in the history of the credit union. Referrals for investment services averaged at 300 for the year and first time investments hit 300 referrals in one month. Checking upgrade saw a 17% increase in new accounts opened and checking acquisition saw a 24% increase in new accounts opened. Further, membership broke AACU’s goals for promotion.